After hearing so many wonderful things about its "bagel and lox" from some friends, Sam (an old college buddy) and Kris (a family friend) and how it's probably the best in the city, Marcus and I sought to verify this bold claim. 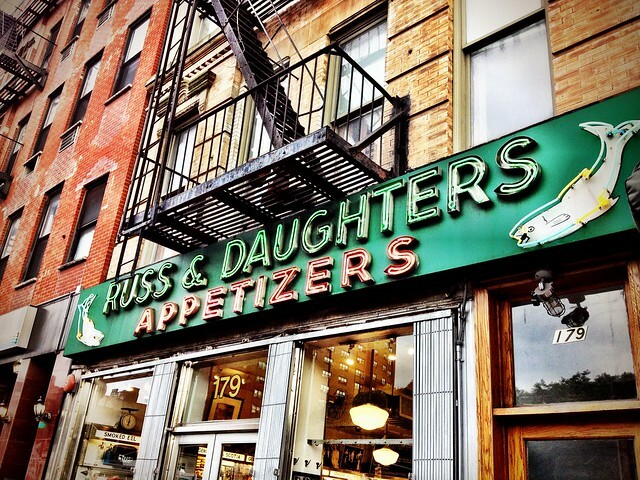 Russ & Daughters is housed in a former tenement building which is listed onto the National Register for Historic Places. I love how the shop's storefront sign is still reminiscent of the time period around which it was opened. Joel Russ, the man who opened Russ & Daughters (a different name back then) back in 1914, apprenticed to be a baker at the age of nine back in Poland (then part of the Austro-Hungarian Empire). He emigrated to the United States in 1907, and after marrying another fellow immigrant, Bella Speier, the following year, they have a daughter five years later (and two more daughters later on). Mr. Russ opens his first shop on Orchard Street, expanding his wares to include salt-cured herring and salmon. Six years later, he moves around the corner onto East Houston Street (where the shop is currently located today), naming the "new" shop J. Russ National Appetizing Store. His daughters begin learning the business from their father beginning at eleven years of age, helping out after school and on weekend. Despite the Great Depression, the Russ' get by with the help of the shop staying afloat during tough times, and Mr. Russ renames the shop to Russ & Daughters in 1933. It is believed to be the first business with "& Daughters" in its title (as opposed to the common "& Sons" seen a lot more frequently. The grandchildren and great grandchildren of Joel Russ gradually take over the business when one of his daughters retires in 1976. It has been in the family ever since. "Appetizing as a noun is a Jewish food tradition that is most typical among American Jews, and it is particularly local to New York and New Yorkers. Used as a noun, “appetizing” is most easily understood as "the foods one eats with bagels. Its primary components are a variety of smoked and cured salmon, homemade salads, and cream cheeses. Appetizing also originated from Jewish dietary laws, which dictate that meat and dairy products cannot be eaten or sold together. As a result, two different types of stores sprang up in order to cater to the Jewish population. Stores selling cured and pickled meats became known as delicatessens, while shops that sold fish and dairy products became appetizing stores." Though one of the last of its kind (there used to be at least thirty appetizing stores in the Lower East Side! 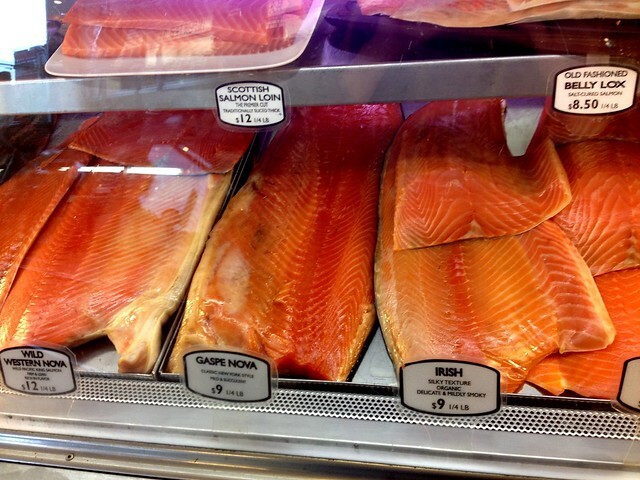 ), Russ & Daughters is committed to preserving and promoting this important food culture. With that being said -- the shop does not wish to be referred to as a delicatessen. 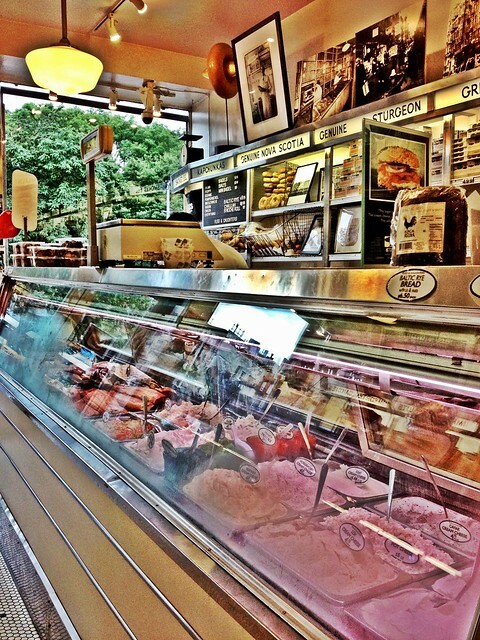 When we walked into the shop, we were floored by how many types of smoked salmon that it carried. Ultimately, we just wanted a really good bagel with some cream cheese and lox, but there were all kinds to choose from. It wasn't as simple as we had anticipated. Given the smoked salmon's description, Marcus decided we should try the Irish smoked salmon, which was organic with a silky texture as well as a delicate and mild smoky flavor. While the bagel wasn't as soft was we both would have liked, the smoked salmon told a whole other story. It was silky as promised and was not overpowering in smokiness at all. The amount of cream cheese schmeared on the bagel was perfect (no excess needed to be wiped away). If you like the simplicity of a bagel and schmear with some lox, this is the way to go. I wanted to make sure we tried something different, so I ordered the pastrami-cured smoked salmon which is seasoned with a special pastrami rub of 14 different herbs and spices. This smoked salmon is aimed for its eaters to enjoy two iconic New York specialties, i.e., smoked salmon and pastrami, at the same time without the cholesterol! I predicted this to be either really, really good or not very good at all. The verdict? It's always great to be pleasantly surprised by an unlikely flavor pairing. We absolutely loved the pastrami-cured smoked salmon -- it had a whole other dimension of flavor that most bagel-and-lox combinations lack, i.e., those heavy herbs and spices from the cured rub. This combination will undoubtedly tease your palate, having it go back and forth, wondering whether you're having a silky pastrami sandwich or a smokey lox and cream cheese bagelwich. It's the best trick to play on your taste buds, and I'll almost guarantee it'll be the next regular sandwich in your repertoire. Findings: It was so fun learning about the extensive history behind Russ & Daughters -- so crazy to think that it's been around since the beginning of the twentieth century. Certainly, this "appetizing store" has garnered a respectable reputation when it comes to specialty seafoods like smoked salmon and caviar, just to name a few. So it was no surprise that the bagelwiches that we had with cream cheese and lox (including Irish and pastrami-cured) were amazing. 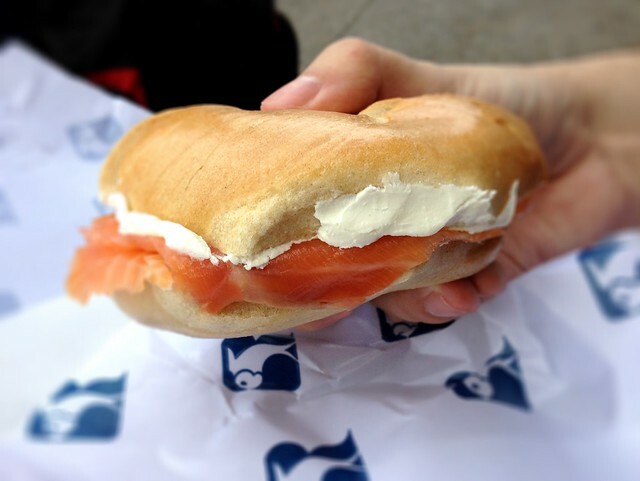 While I can't speak about the bagels on which they were served (they were kinda hard to bite into), the quality of the fish was spot on. 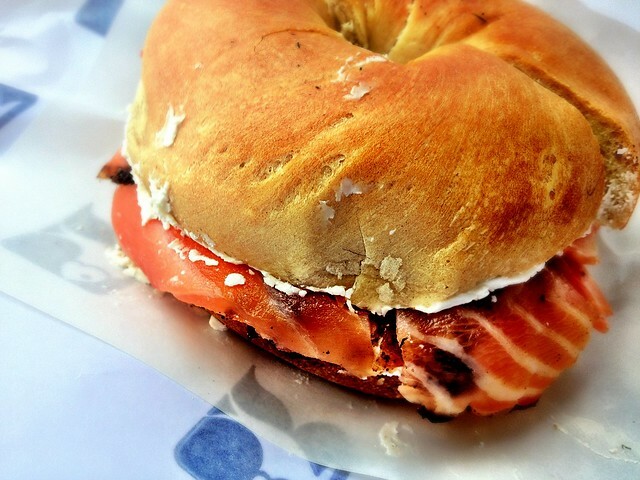 So if you're looking for arguably the best bagel-and-lox in town, this surely may be it! Thanks again to Sam and Kris for their awesome recommendation! Price point: $10.75-11.25 for each lox-bagel sandwich.